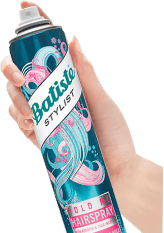 Beautiful Brunettes can now rejoice as Batiste Dry Shampoo Plus has been specially formulated to bring out the best in brunette hair. This 2 in 1 instantly refreshes hair whilst the hint of colour blends seamlessly, helping disguise white residue, root regrowth on coloured hair or covering any stray greys. 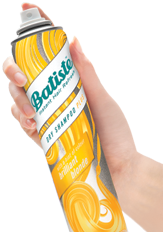 Using Batiste Beautiful Brunette in between wet washing can help reduce coloured hair fading. It’s a great way to extend time before home colouring or your next salon visit. Dry Shampoo with added value - for all hair types. Fragrance: Bergamot, Jasmine, Vanilla Bean, Musk. A tinted dry shampoo for blonde hair. Invisible Hairspray with 24 hour hold without the stiffness. 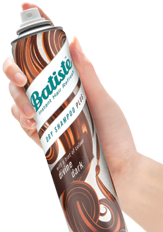 Batiste Dry Shampoo Plus has been specially formulated to bring out the best in brunette hair, with a hint of colour to blend seamlessly. Shake vigorously before use. Keep nozzle about 30cm from dry hair, section and spray into roots working all over your head for maximum effect. Massage thoroughly with fingertips to ensure roots are fully covered and colour blends. Gently brush through hair from roots to ends to remove excess residue and style as desired. Butane, Isobutane, Propane, Oryza Sativa (Rice) Starch, Alcohol Denat., Parfum, Limonene, Linalool, Distearyldimonium Chloride, Cetrimonium Chloride, CI 77491, CI 77492, CI 77499 (Iron Oxides).